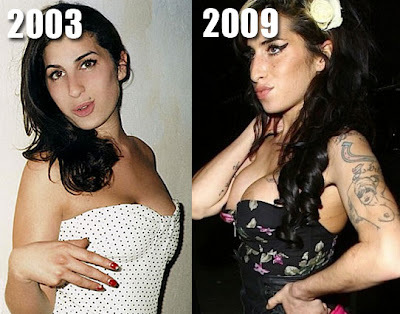 Amy Winehouse before and after breast implants. If you're like me, you have probably asked yourself the question "what does Amy Winehouse do while shes not chasing the dragon". Well, wonder no more because the answer is clear, she enjoys getting large lopsided breast implants, in a poor attempt to gain attention after slipping into the dark obscure realm of no return, that celebrity singers almost never recover from. Judging from the before and after picture, she is still getting the hang of her new breast implants (no pun intended) as they look to be popping out all over the place. I have a feeling this isn't the last time we'll be mentioning Amy Winehouse and plastic surgery in the same sentence. Just a hunch. She really didn't need plastic surgery, just needed to put on a few pounds after losing so much weight with her nasty habit. She really should focus her plastic surgery on her face. That mug is awful.